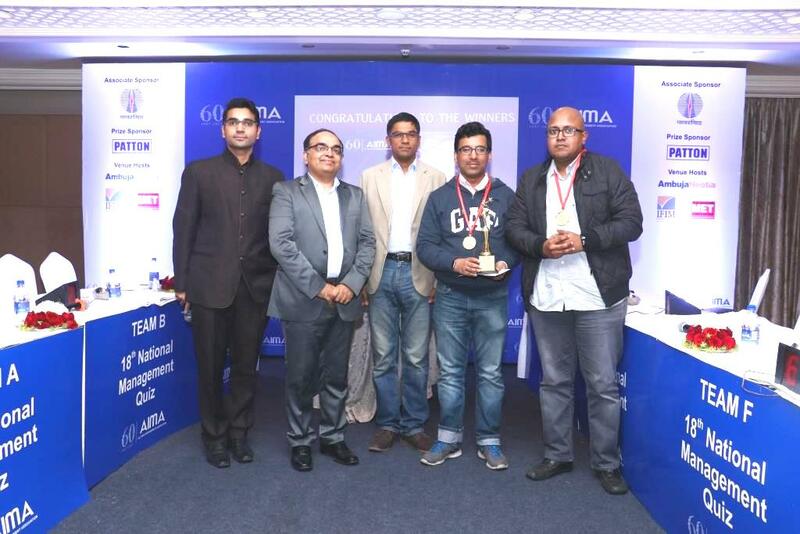 AIMA organised the 17th edition of the National Management Quiz in May, 2016 in Bangalore, Kolkata, Mumbai and New Delhi. We received an overwhelming response with participation of over 80+ teams from all over India comprising of both Private and PSU's companies. The regional winners were TCS team and SABMiller from South, Capgemini and SAIL team from east, Godrej and Boyce and RBI from west and HCL and Indian Oil from North. The regional rounds were organised at M S Ramaiah Institute of Management, Bangalore, Indian Institute of Social Welfare and Business Management, Kolkata and Mumbai Vivekanand Education Society's Institute of Management Studies & Research , Mumbai. The Grand Finale was organised along with the Northern region round on 28th May, 2016 at Hotel Cladriges, New Delhi. It saw the regional winners battle for the top honors with great enthusiasm. The finals brought together the sharpest young minds to take on the heat of the toughest and interesting questions thrown at them. It was a superb show of copious flow of knowledge and Intelligence packaged in exciting rounds. Quiz Master Ajay Punia's distinctive style of quizzing, and sense of humor made the audience glued to their seats. The winners for this year's contest was Tata Consultancy Services Ltd followed by SAIL and SABMiller as 1st and 2nd runner up respectively. This year's initiative was supported by Pepsico India Holdings Pvt Ltd, Mother Dairy Fruit and Vegetable Pvt. Ltd, BPCL and AIMS Institutes, Bangalore. The Chief guest for the day was Ms Pooja Malik, Vice-President - HR, Corporate Office at Anand Automotives Ltd. The winners were felicitated by Ms Malik with trophies, Pepsi gift hampers and cash prizes. Her concluding remarks were stimulating and inspiring. She congratulated the winners and appreciated the AIMA initiatives.